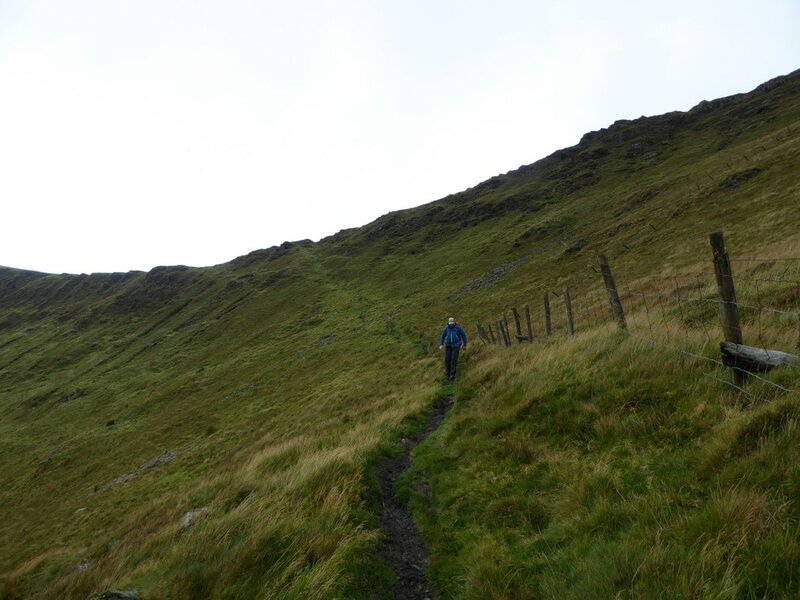 There were good mountain paths from the col to the west below Tomle to Moel yr Ewig. 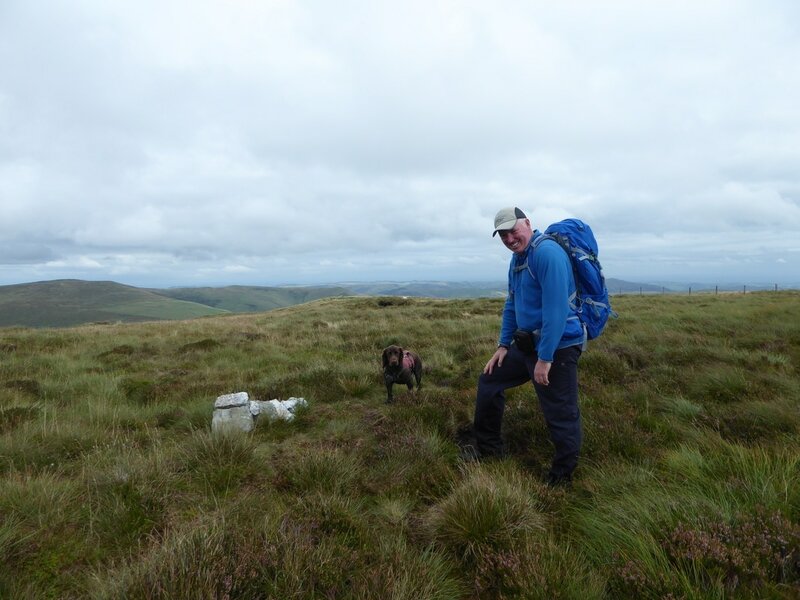 The remainder of the walk is over mainly pathless and somewhat boggy terrain. 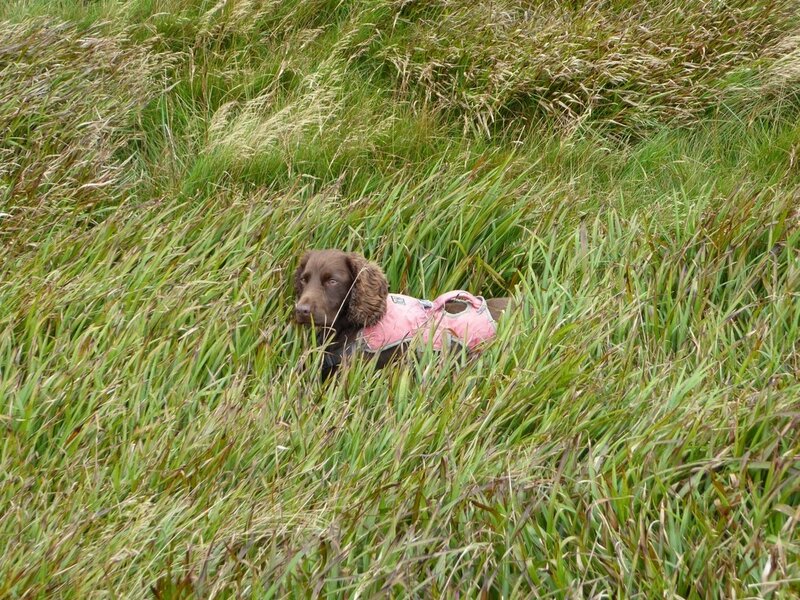 However this was walking with lots of variety today. 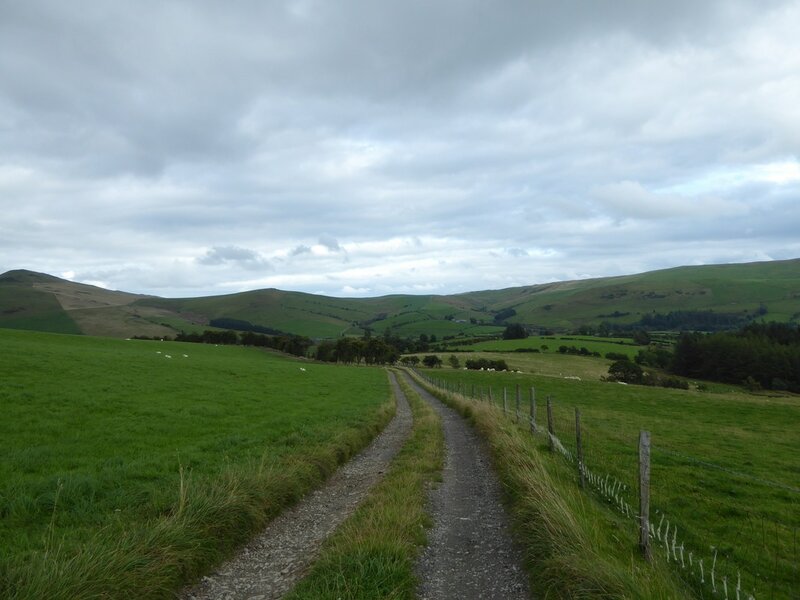 This was our first visit to the Berwyns & the beautiful Ceiriog Valley - it did not disappoint. 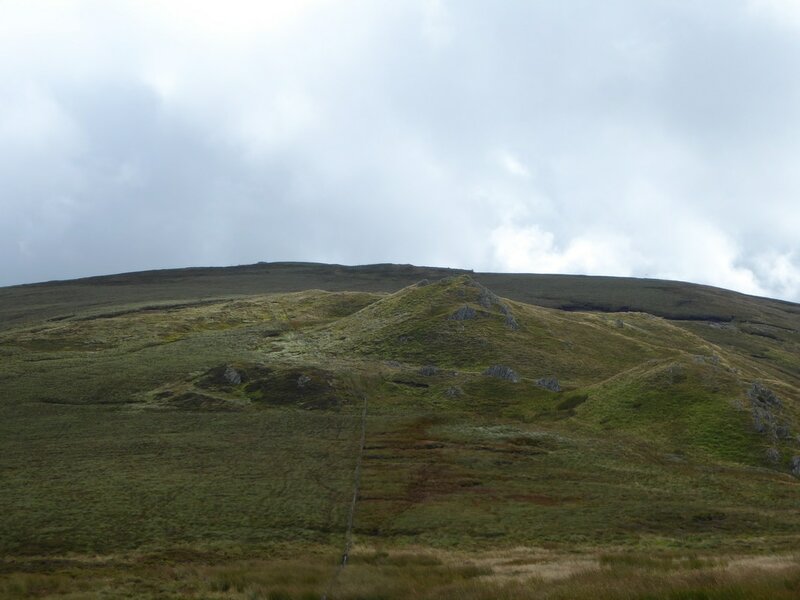 The Berwyn range is an isolated and sparsely populated area of moorland located in the northeast of Wales, roughly bounded by Llangollen in the northeast, Corwen in the northwest, Bala in the southwest, and Oswestry in the southeast. 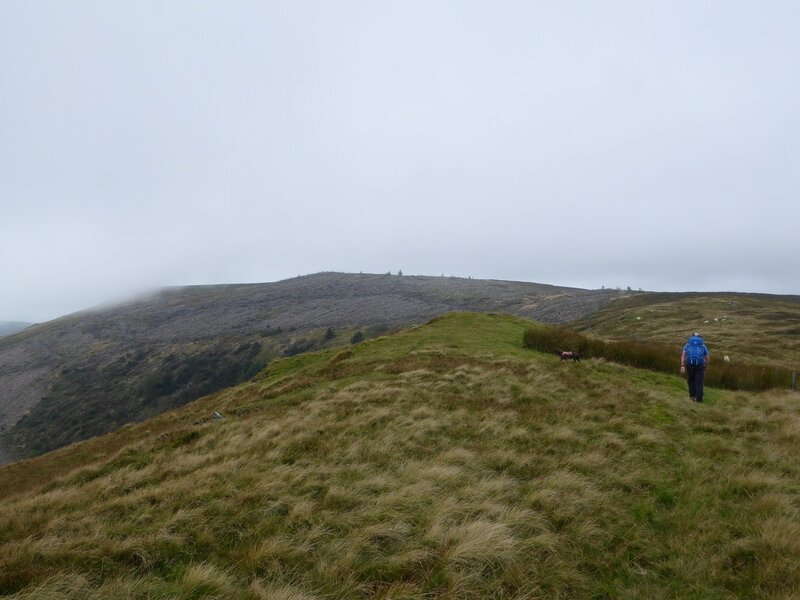 The car journey to the start of the walk took us through the beautiful Ceiriog Valley, described by David Lloyd George as "A little bit of heaven on Earth". 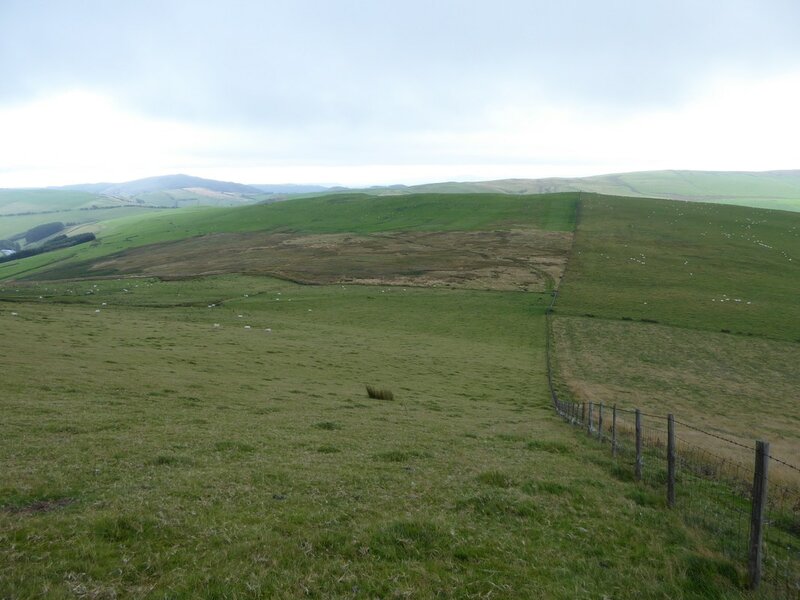 Not far from the English Border, it is relatively undiscovered and considering its closeness to the A5, it remains unspoilt and receives few tourists - all the more reason to come here. 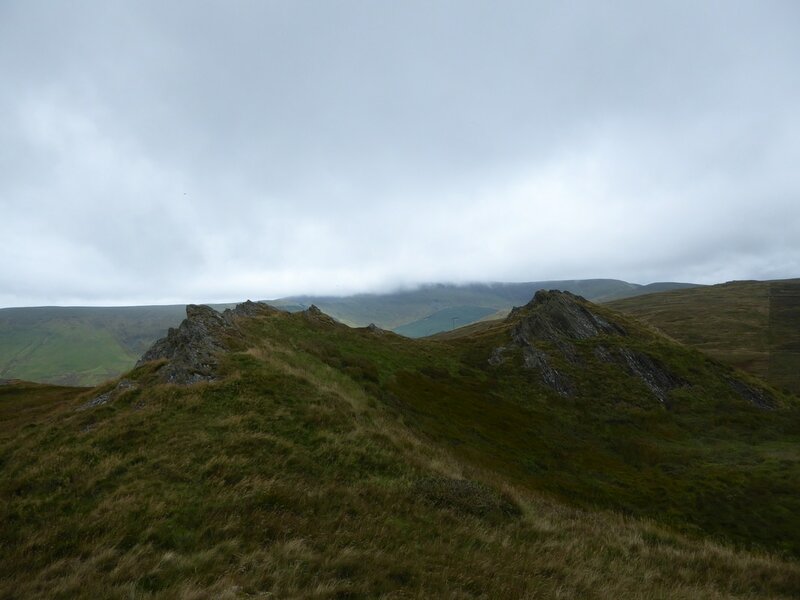 As for The Berwyn Mountain Range itself well it has the lot. 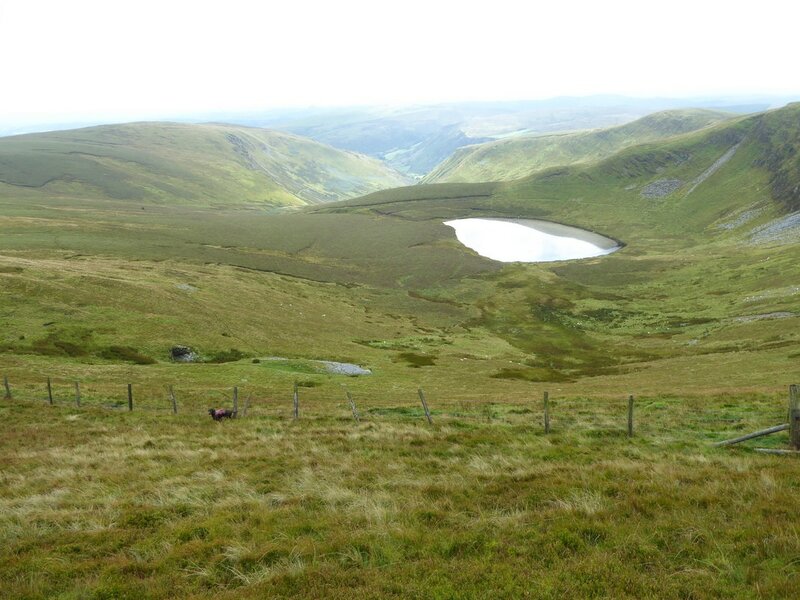 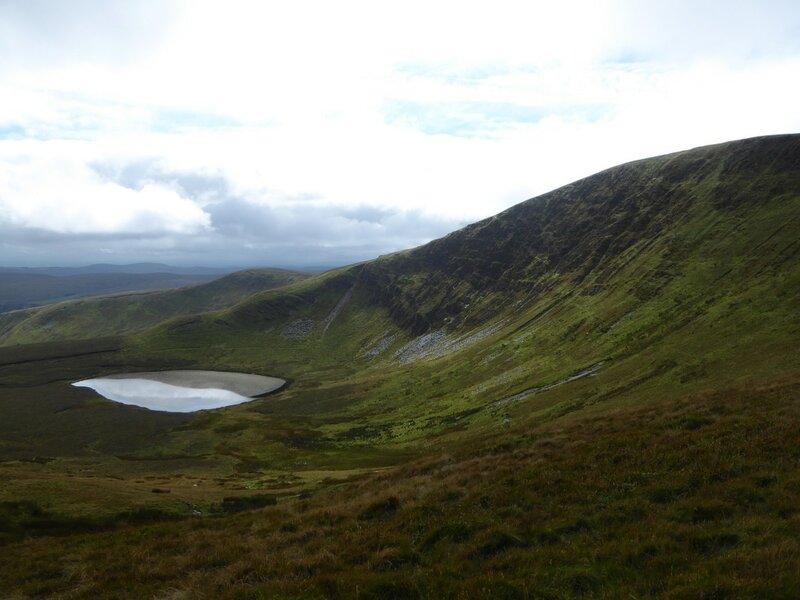 Vast and open moorland, steep crags, hanging valleys and impressive waterfalls - not to mention the mountains themselves. 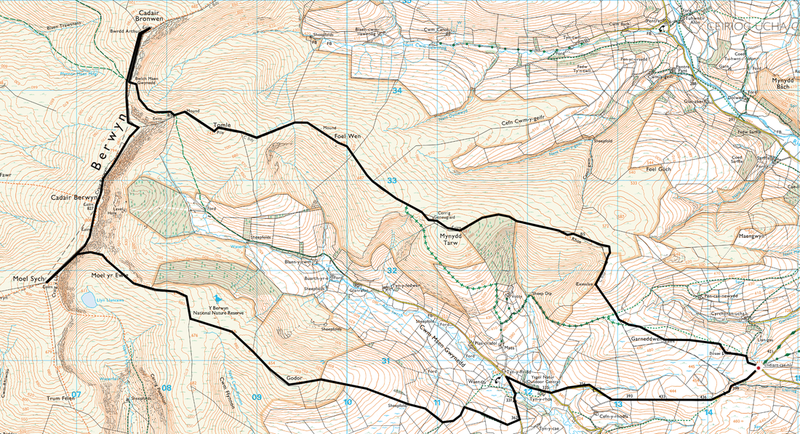 There are several ways to access the Berwyns however today we decided to reach them from the east. 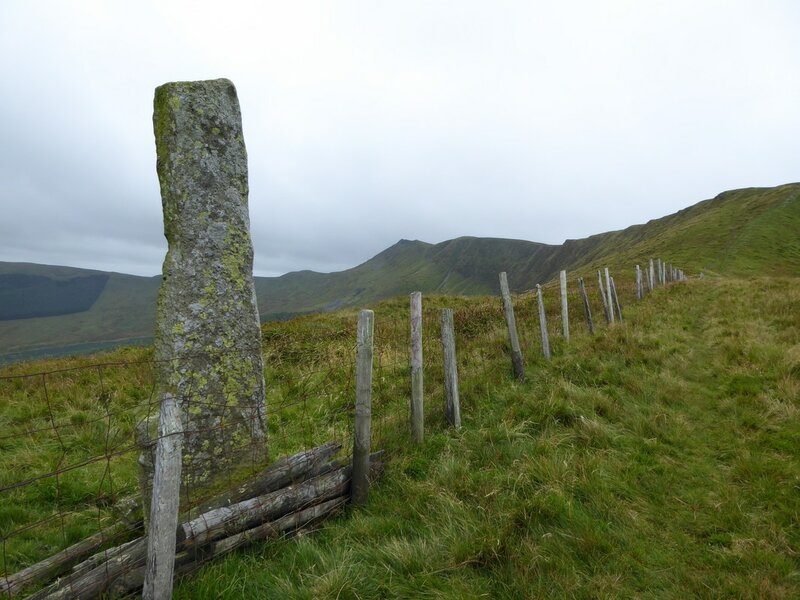 The walk started from the small lay by at Llidiart-cae-hir where there is room for several cars. 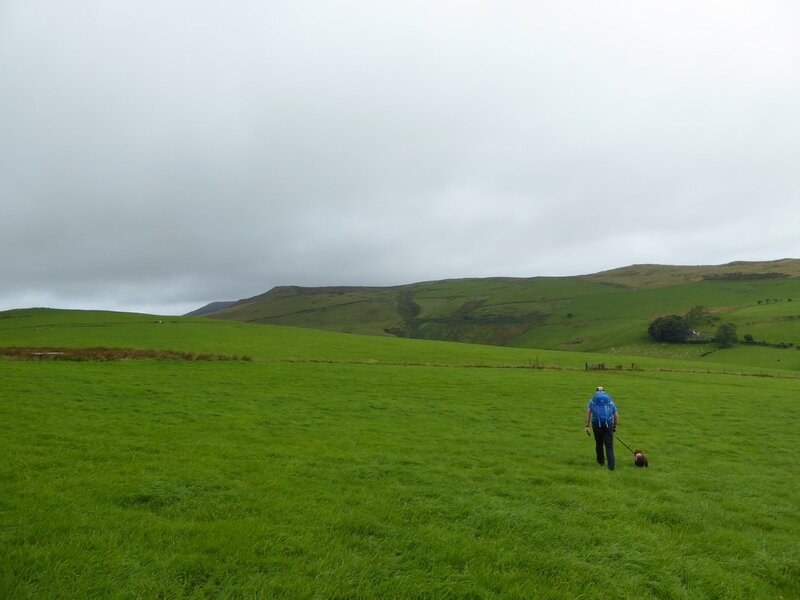 Ordinarily, people would probably commence the walk further to the west than we did at Tyn-y-ffridd Farm but we were happy to make the walk a bit longer. 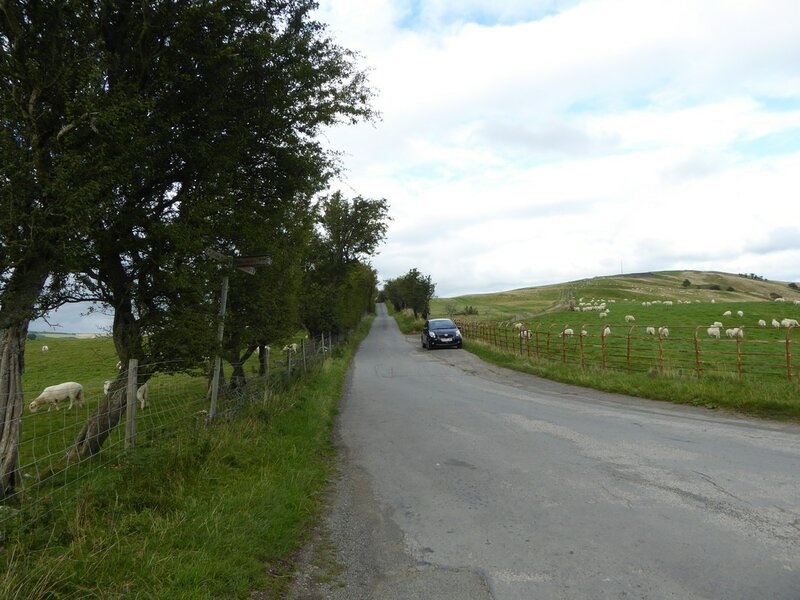 Leaving the parking area the route headed through fields to pass over Garneddwen to reach a field corner where there was a sharp ascent up a fence line to reach a boundary stone. 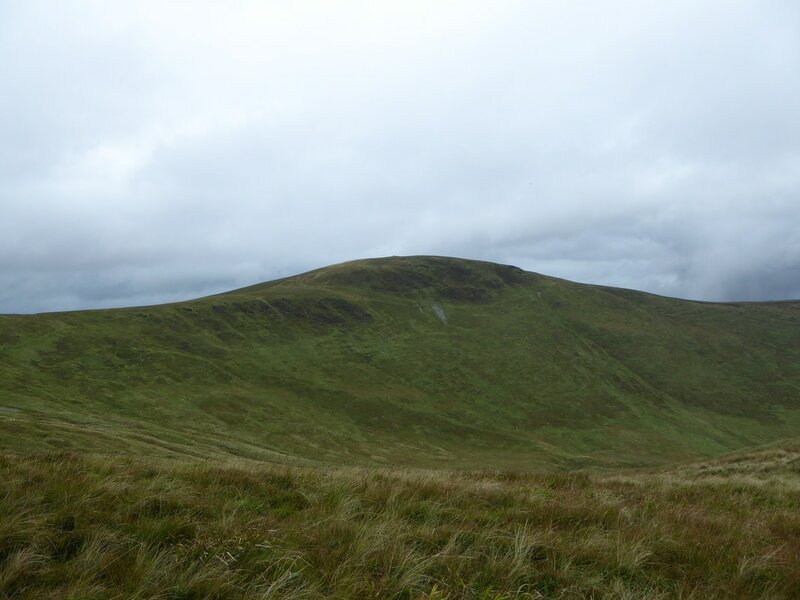 From here we headed around to the highest point on Rhos before starting the gradual, and pathless in places climb to the summit of Mynydd Tarw and its large stone shelter. 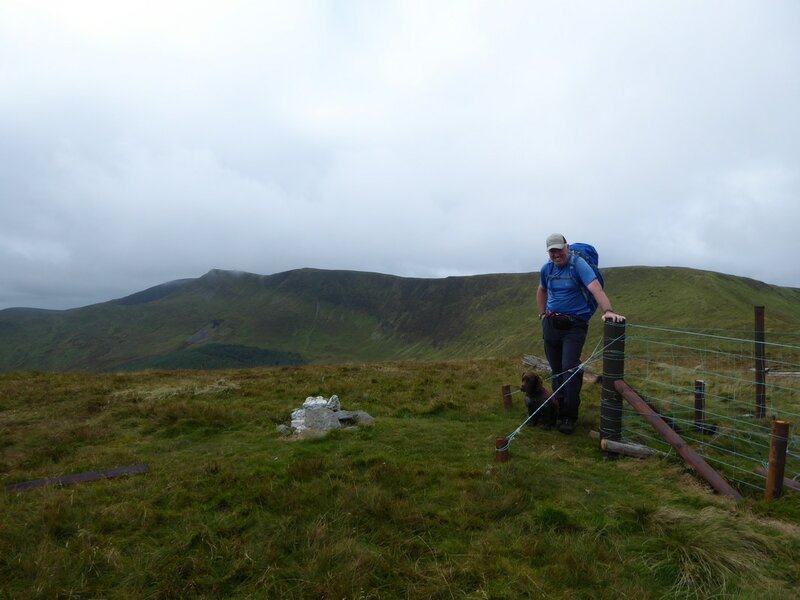 There were extensive views from the top of Mynydd Tarw, particularly of our route ahead with the Berwyn range prominent. 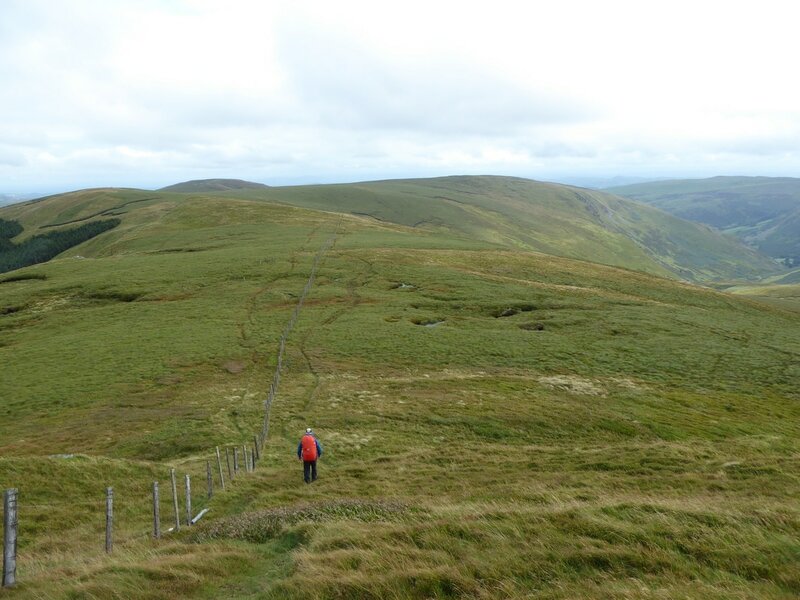 Leaving the summit the route continued to follow the fence line to shortly pass over a rocky crest to reach the unmarked summit of Foel Wen South Top from where we dropped down into a col before climbing out again to gain Foel Wen. 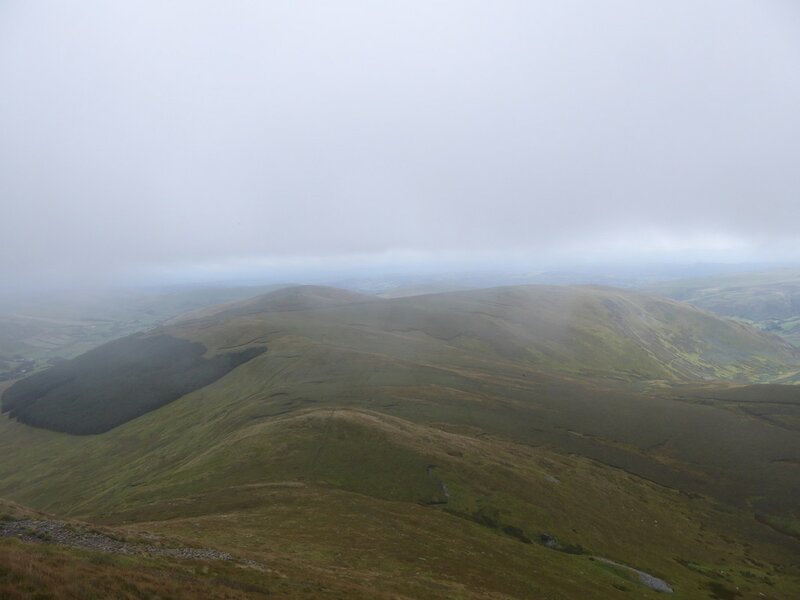 The weather at this point was staying pretty constant - just overcast but dry and we were hoping that the visibility would last until we were able to walk along the Berwyn ridge - we would see! 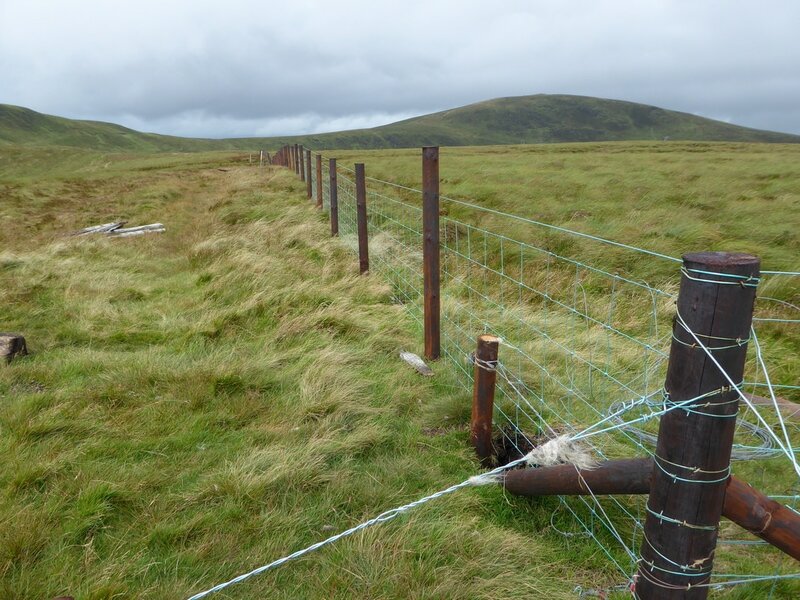 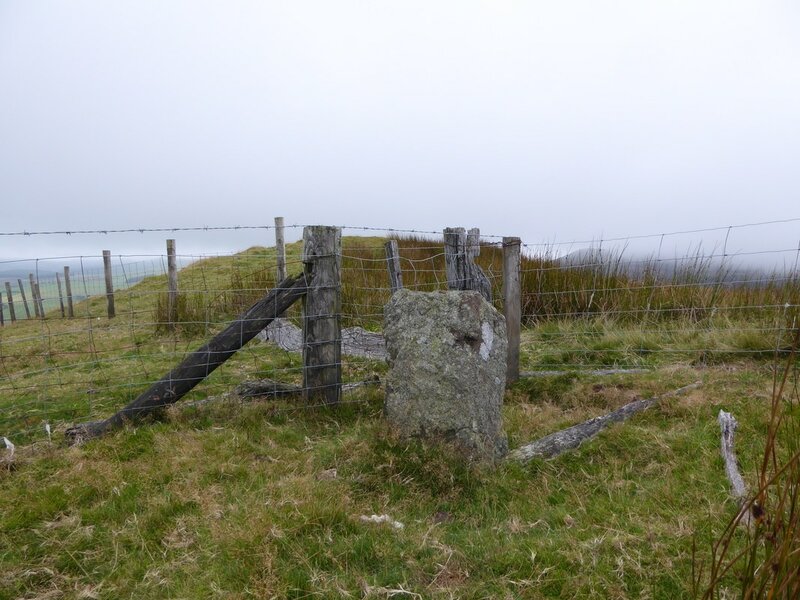 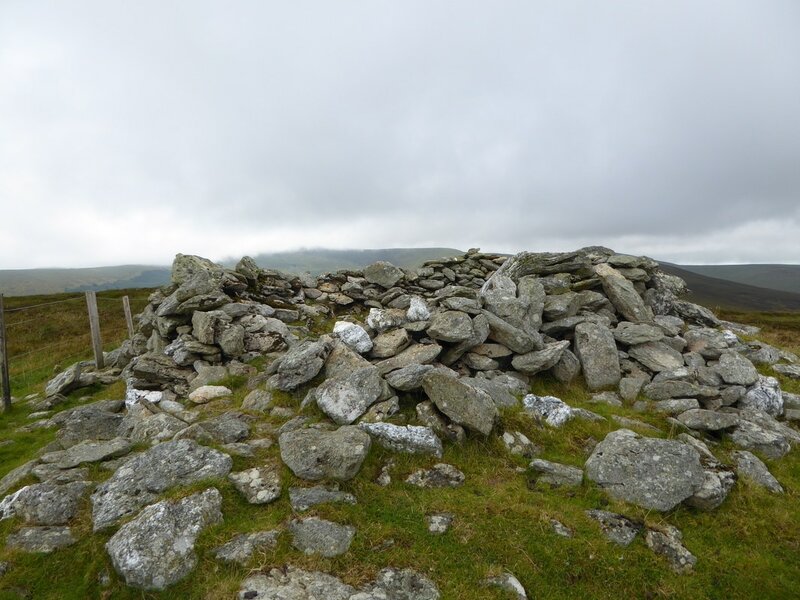 From Foel Wen we could make out the next summit of Tomle ahead and it was a simple case of following the fence which made a sharp left turn near the top to reach the small quartz cairn which marks the highest point. 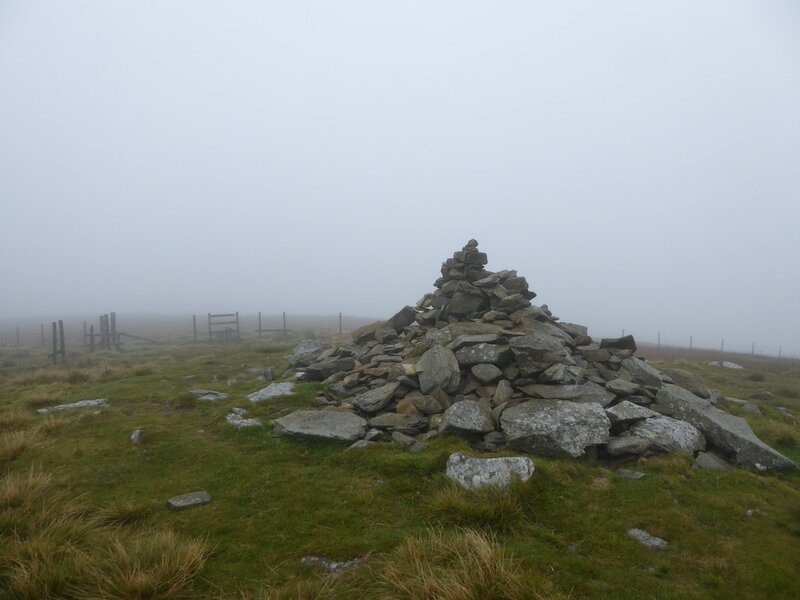 From Tomle we again could see our route ahead clearly and we made our way down to the col to arrive at the large 8ft Standing Stone. 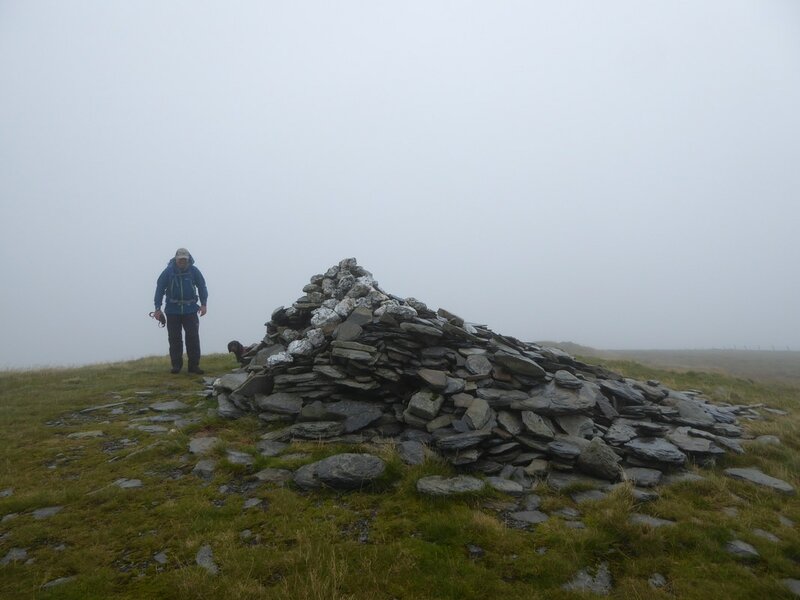 From the col, the route then slanted to the right to crest the ridge, turning right once more to make our way up the gentle rise to reach the impressive cairn on the summit of Cadair Bronwen - approaching the summit visibility deteriorated markedly and it began to chuck it down. 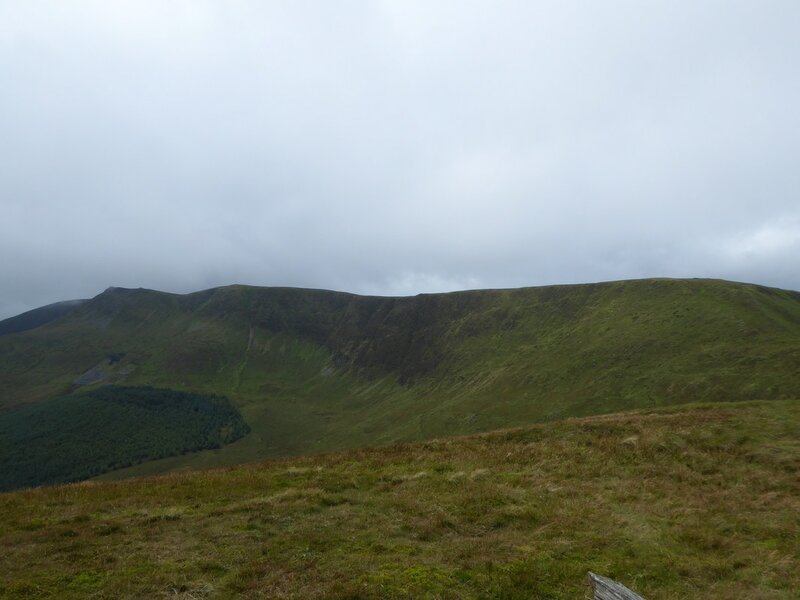 We headed back the way we came to the col once more before heading up Craig Berwyn on a gently rising path to reach the Trig Point on Cadair Berwyn - the clag was still down therefore no views from here. 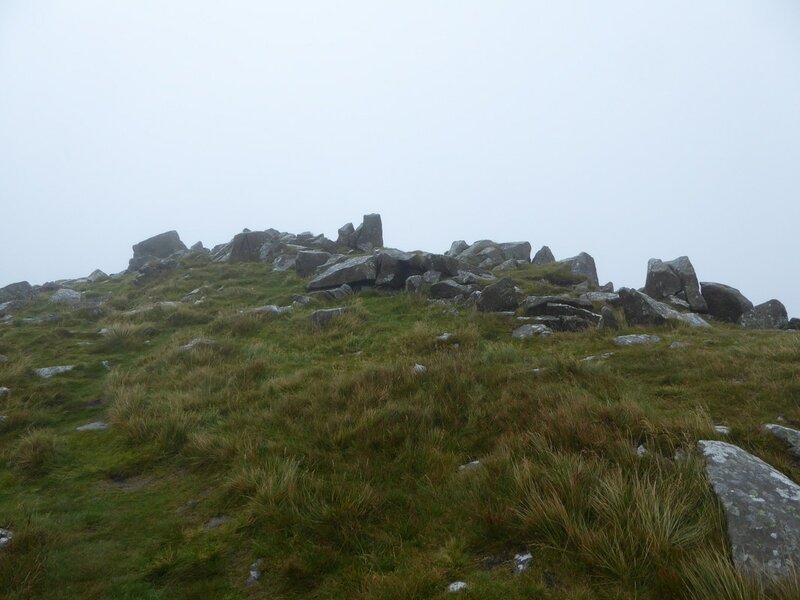 A short journey with a slight descent and ascent took us to the shattered rocks on the summit of Cadair Berwyn New Top from where we made a quick out and back to bag Moel Sych. 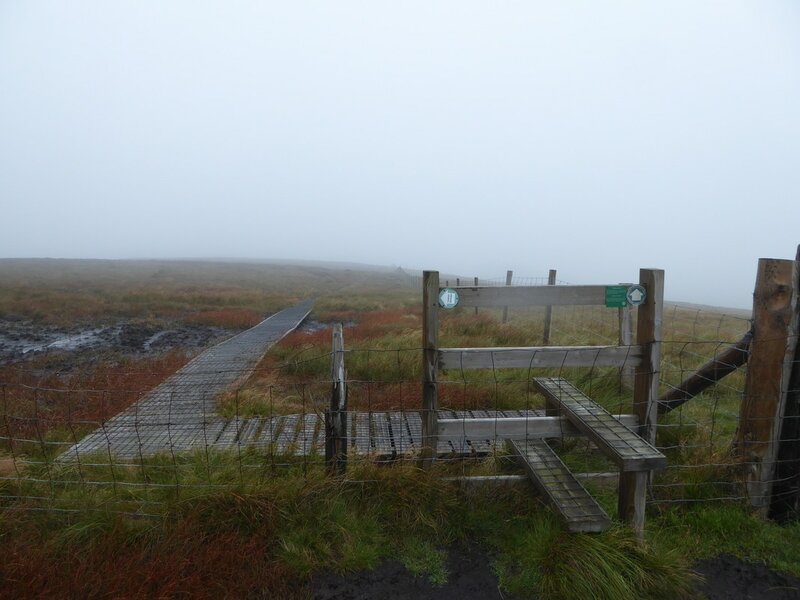 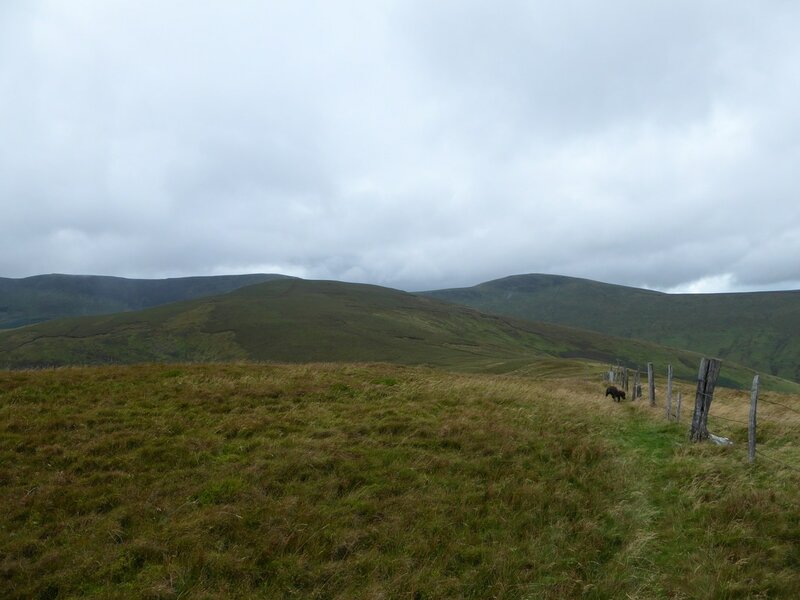 The weather was starting to improve as we searched out the path which would lead us off the ridge down to Moel yr Ewig - this path is not that easy to see from above although if missed there is a fence a bit further along which can be followed down over steeper ground. 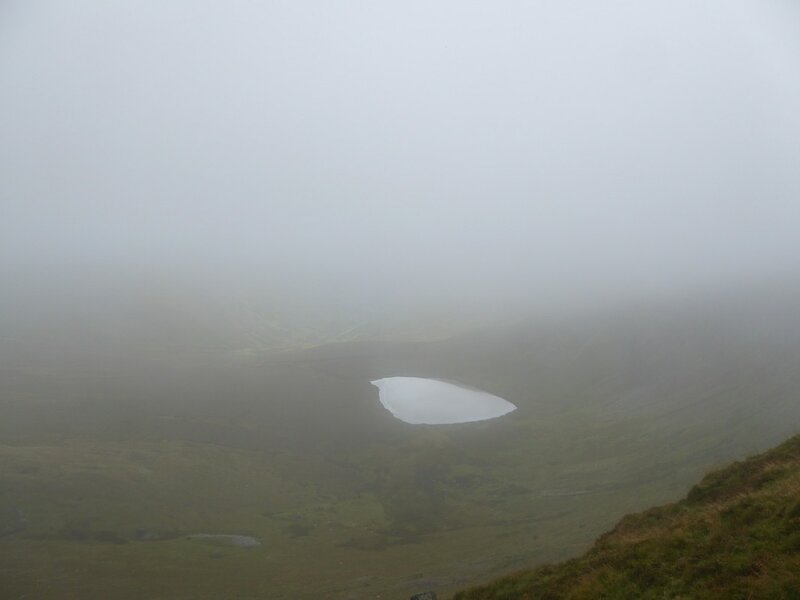 Descending from the ridge the visibility improved, so much so that we were able to eventually see the delightful sight of Llyn Lluncaws away to our right. 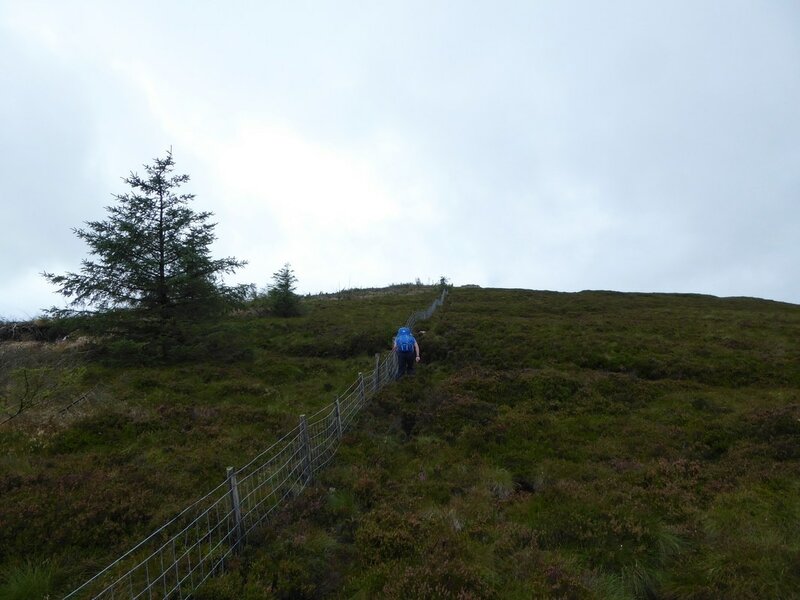 The remainder of the route then passed over mainly pathless terrain to summit Moel yr Ewig, Godor North West Top and Godor before descending gently to reach a farm track. 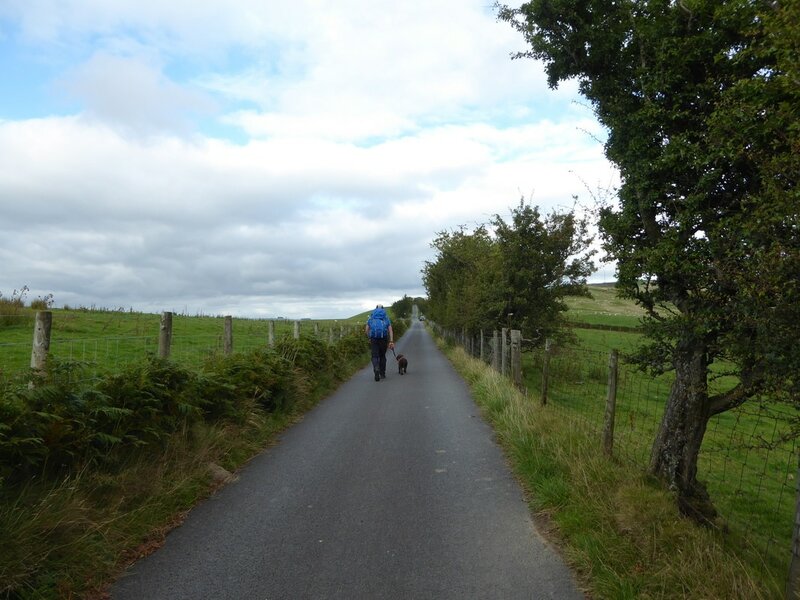 It was now just a question of following the farm track to meet the road at Tyn-y-ffridd - from the farm it was about a mile or so of road walking on a quiet lane to reach our car. 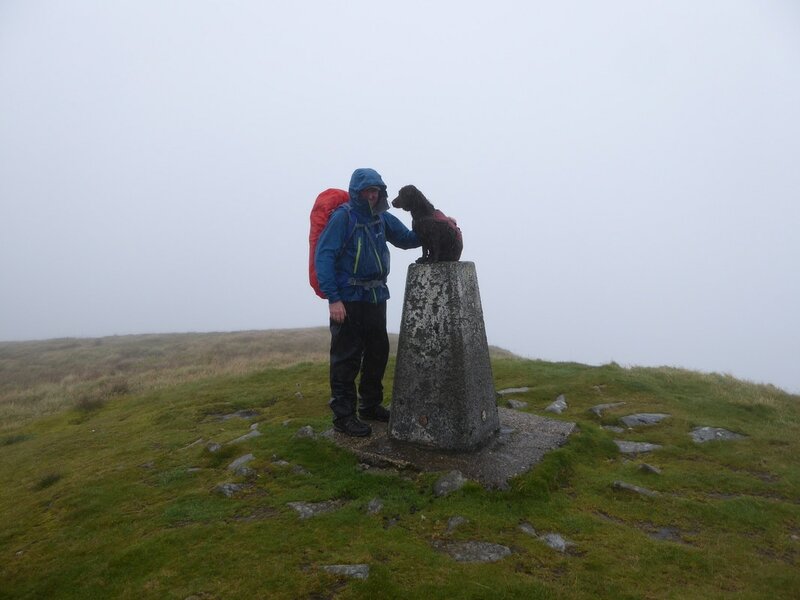 We were both generally and pleasantly surprised by how empty the Berwyns were today - ok the weather wasn't brilliant but we saw nobody else all day. 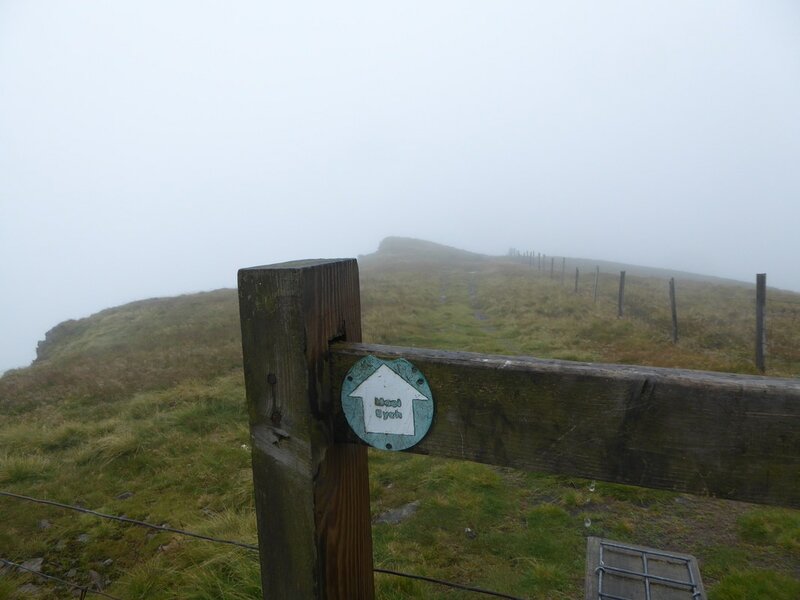 We will definitely be back to do this walk again as we imagine that in good visibility the walk will be even better than it was today.